Santa will be busy again this year with his many helpers! We have made some minor changes this year to take into account the new housing developments in Southwell and the villages. We aim to start at around 6.00 pm and finish at 9.00 pm, but due to the many children we see, all timings are approximate. Please bear with us if we are not quite on schedule. 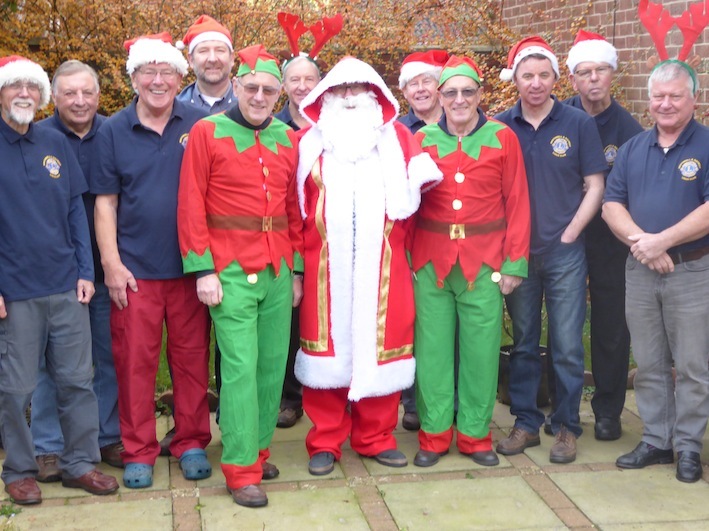 We sincerely hope that Santa and his helpers will see as many of the children and adults in Southwell and District in the two weeks before Christmas. Santa and the float will be outside the Rodney on 23rd December from approximately 8.30am to 1pm. 6.05 Cottams Close, Ruby's Court, Fiskerton Road. 8.30 Rolleston: Fiskerton Road, Holly Court, Manor Farm Close, Croft Farm Close. We collect Springfield Road in 2 sections, with those from 83 to 47 at the end of this route. 6.00 Ropewalk, Monckton Drive, Manor Close, Appletree Close, Private Road. 7.30 Becketts Field, Halloughton Road, Halloughton Close. 8.30 Church Street from the Minster up to the Hearty Goodfellow. 8.40 Church Street from the Coach House to the Hearty Goodfellow.